Register now and join the GREENTIC team on the web. About the the Green IT Day. The Green IT Day Program. Energy Transformation and Management for Telecom Networks. OPERA-Net: Optimising Power Efficiency in Mobile RAdio Networks. 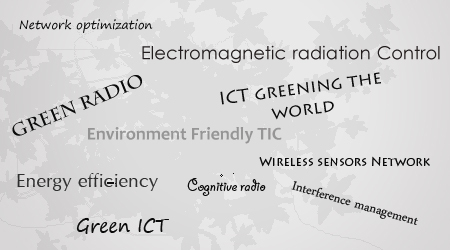 Cognitive Radio in the Green Communication Paradigm: Vision of the IC0902 Cost Action . Fundamentals of Cognitive Green Small Cell Networks. Single-radio antenna arrays for reduced transmission power and circuit energy consumption. 4G multi-mode modems: analysis of architecture and power consumption trends. The role of green ICT in creating business opportunities for developing countries. Seminar on "Design and evaluation of FMT systems with low complexity in mobile radio environments"
Seminar on "A random matrix framework for the analysis of future cellular networks"